Some photos taken on stage 4 of the London Loop. I walked this section on the 1st February 2005. It was a grey day but not always as gloomy as some of the photo's make out. 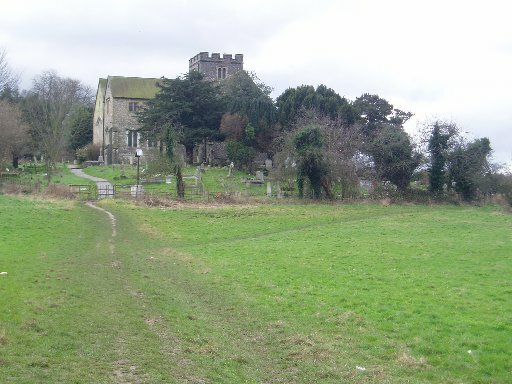 The first picture is a view of St John the Baptists church near Coney Hall. 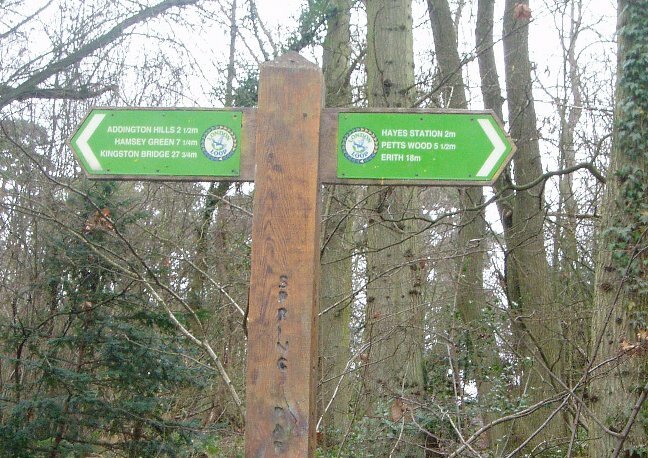 The second is of a London Loop sign in Spring Wood. I'm not sure how correct the distances shown are! While there might be three and half miles between Hayes and Petts Wood as the crow flies it is much more by the loop path itself. 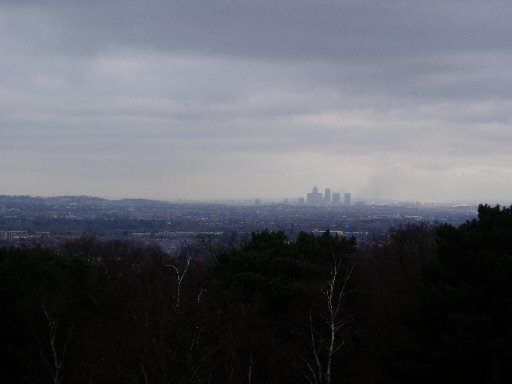 The third picture is a view down Addington Hill and fourth the view from the top of the hill across to Docklands, some 10 miles away. A shot the camera could not really handle. 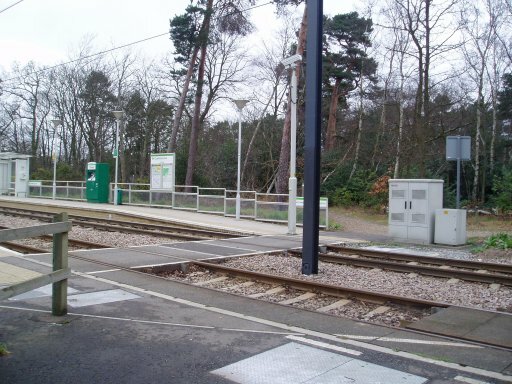 The fifth picture is of Coombe Lane tram station which appears as you come out of some woodland and is a bit of novelty if you are not used to trams. 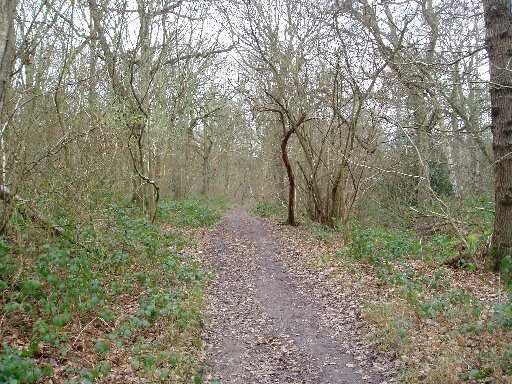 The sixth photo shows the path as it heads toward Little Heath Woods where it joins the route of the Vanguard Way (which runs from Croydon to Seaford) for a mile or so. 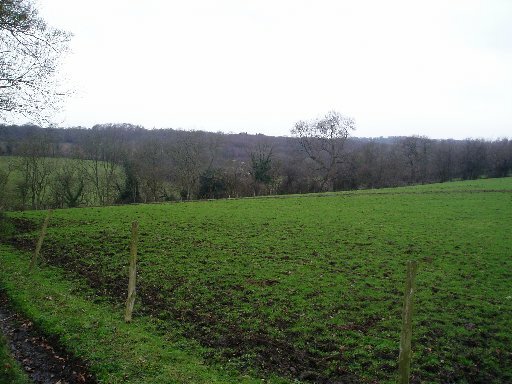 The next photo shows the loop path going through what is shown on the OS 25000 map as Puplet Woods and the final photo is of farmland near Hamsey Green. Including the walk from Hayes station this stretch was about 9 miles long. 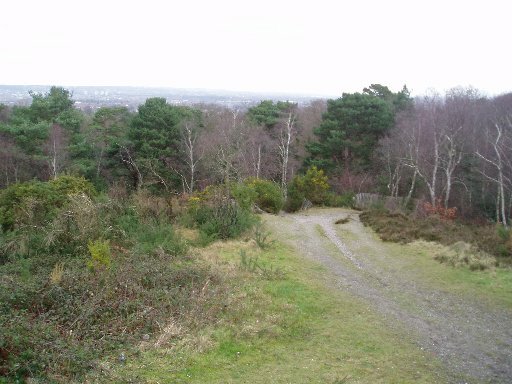 There are very few urban stretches on this stage and for the edge of London the walk was surprisingly hilly. I had considered walking a bit further however as I approached Hamsey Green the weather began to get wetter and wetter and the light drizzle gradually turned to fairly steady rain and I was glad of the bus shelter while waiting for the bus to East Croydon station.